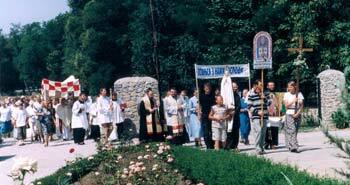 In 1995, during the Armata Bianca’s peregrinatio Mariae in Ukraine, the Virgin of Fatima came to Zaporoze (Запоріҗжя), welcomed by the Polish Father Jan Sobilo, the first Catholic priest operating in this city. 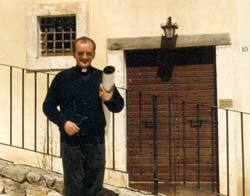 From this encounter the first church in the world dedicated to God the Father arose. 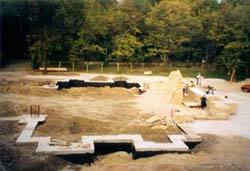 “(…) The Virgin of Fatima’s visit to Zaporoze was for all of us, but for me in particular, a great light and a great encouragement during that very difficult time; in fact, the political authorities gave me the permission and the place to build a church, however, I had no possibility whatsoever of getting the money needed. The Holy Father blesses the decision of building a church in Zaporoze in honour of God the Eternal Father, and he imparts His blessing on all those who undertake this work. Immediately after the meeting with the Pope, Father Sobilo came to visit us at our head office in via Sant’Apollonia in Aquila, gave us the project blessed by the Pope and, with a disarming smile, said: “I did my share, now the Armata Bianca must look after the rest, as promised”. The Pope’s desires are commands, so we gave him the first million that we were able to collect in order to start building the foundations. We asked his Superiors for the written consent to open an international bank account in which to send the donations, which only he and his bishop could have access to. He gave us the requested material in very little time. We officially entrust the Armata Bianca association with headquarters in Aquila/Italy with the task of opening an international bank account in order to collect donations for the construction of the church dedicated to “God the Merciful Father” in Zaporoze, Ukraine. I would like to thank you for everything you have done for us. We have already begun the church of God the Merciful Father in Zaporoze (more than a million inhabitants – Eastern Ukraine) and we hope to build this jubilee temple with the help of benefactors. Thank you for your kindness regarding this project and for your union with us in prayer. I would like you to be, on my behalf or on behalf of the Committee for the collection of Funds, the “special power of attorney” in order to appeal to the goodness and generosity of good people in Italy. 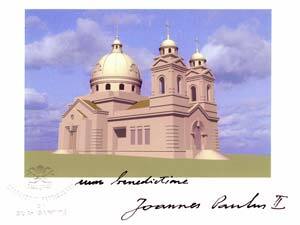 “Thanks especially to the financial aid sent by the Armata Bianca, the first church dedicated to God the Father is now a reality. 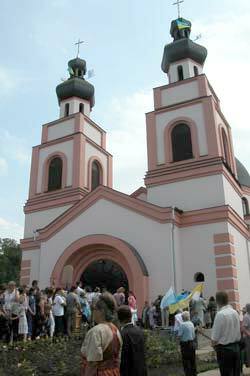 At its inauguration on 7 August 2004, Catholics, Greek Catholics and Orthodox were present and concelebrated, and today it is the place of pilgrimage for people coming from many parts of the Ukraine. On our invitation, the Orthodox used our church to celebrate the solemnity of Christmas and Easter in front of the magnificent icon of God the Father, which was also realized by the Armata Bianca”. 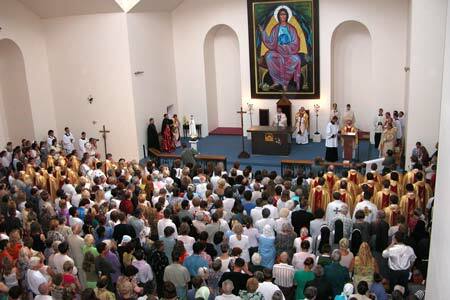 The church of God the Father is now a co-cathedral of the two dioceses of Charcov-Zaporishia and a place of pilgrimage for people coming from Poland and the Ukraine.